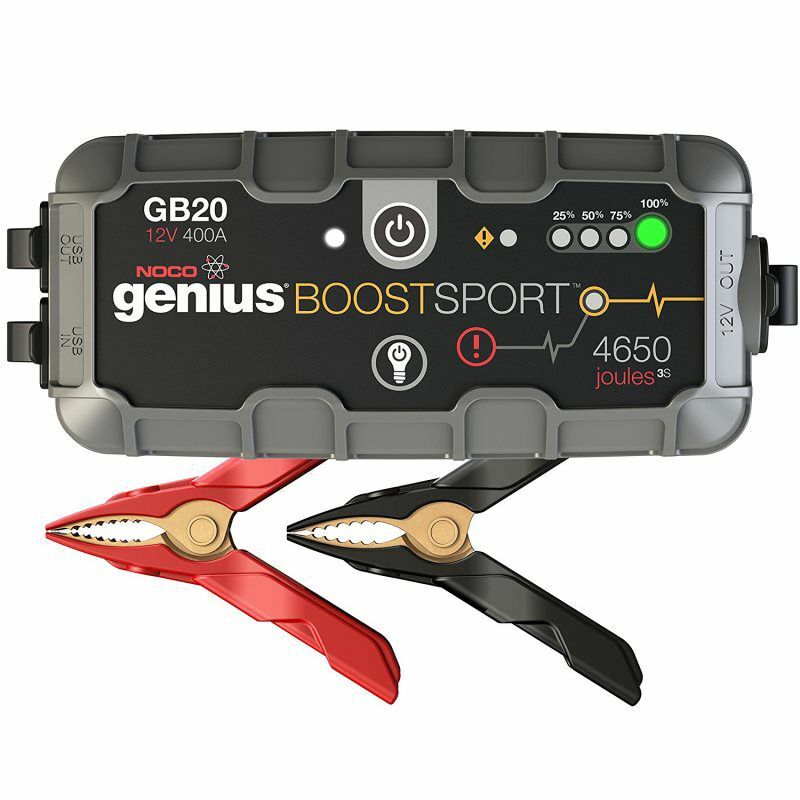 The GB20 is an ultra-portable, lightweight and compact lithium-ion jump starter for 12-volt batteries. With it, you can safely jump start a dead battery in seconds - up to 20 times on a single charge. It's mistake-proof, making it safe for anyone to use and features spark-proof technology, as well as reverse polarity protection. The GB20 lithium jump starter integrates with a high-output 100 lumen LED flashlight with seven light modes, holds its charge for up to one year and features a USB battery pack for recharging personal devices on the go - up to 4 smartphone recharges. It's rated at 400 Amps (4,650 Joules3S), and suitable for use on gasoline engines up to 4 Liters (not recommended on diesel engines), such as a motorcycle, ATV, lawnmower, car and more. 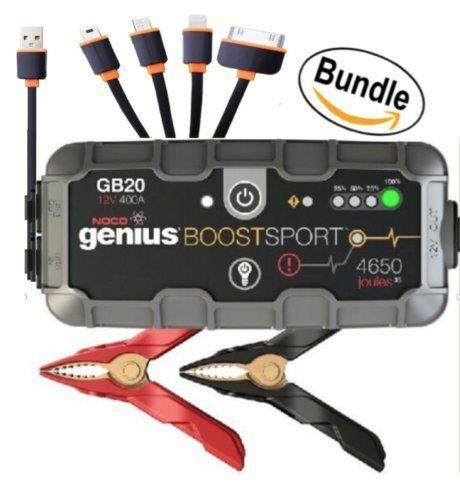 Includes the GB20, needle-nose battery clamps, USB charging cable, microfiber storage bag, our 1-year hassle-free limited warranty, and free lifetime customer support Other commonly used search terms include: jump starter,jumper cables,car jump starter,battery jumper,car starter,car battery jump starter,car jumper,jump pack,car jump,jump starter power bank,battery booster,battery jump,jumper pack,jumper battery,battery jump pack,portable jump starter,jumpstart,jumper starter,battery jump box,jump starters,jump starter with compressor,genius boost,booster pack,portable car battery jump starter,jump starter pack,jumper box portable power,jumper box,jump starter air compressor,jump starter kit,jump battery,noco genius boost,lithium jump starter, jumper starter diesel, diesel jump starter, battery jump starter. The creative 4-in-1 Design which charges most of the Mobile phones available on market (Charging only, not for Sync Data). Simple, lightweight, portable and convenient. (4 in 1,3 Feet/100cm) Carry this durable multiple cord with you anywhere, perfect for home use and office or business and travel. 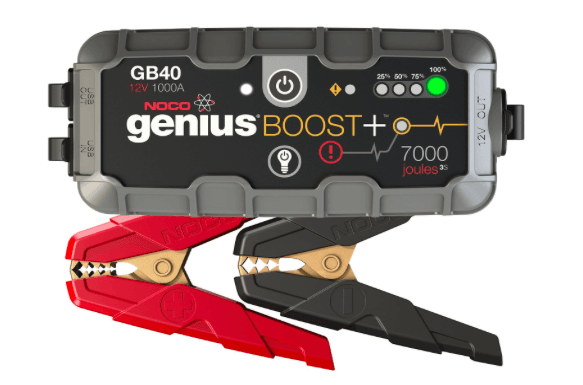 The GB40 is an ultra-portable, lightweight and compact lithium-ion jump starter for 12-volt batteries. With it, you can safely jump start a dead battery in seconds - up to 20 times on a single charge. It's mistake-proof, making it safe for anyone to use and features spark-proof technology, as well as reverse polarity protection. The GB40 lithium jump starter integrates with a high-output 100 lumen LED flashlight with 7 light modes, holds its charge for up to one year and features a USB battery pack for recharging personal devices on the go - up to 4 smartphone recharges. It's rated at 1,000 Amps (7,000 Joules3S), and suitable for use on gasoline engines up to 6 Liters and diesel engines up to 3 Liters, such as a car, boat, lawn mower and more. Includes the GB40, HD battery clamps, USB charging cable, USB car charger, microfiber storage bag, and our 1-year hassle-free limited warranty. 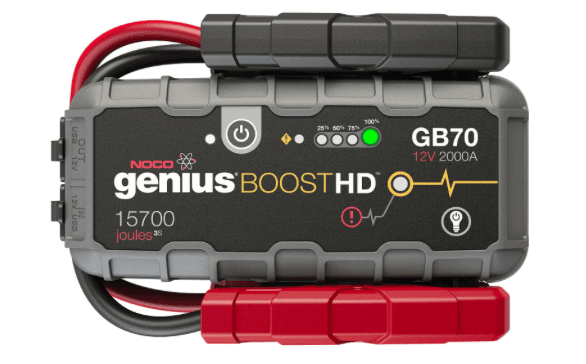 Designed for gas engines up to 8 Liters and diesel engines up to 6 Liters for cars, boats, trucks, tractors and more The GB70 is a compact, yet powerful lithium-ion jump starter for 12-volt batteries. With it, you can safely jump start a dead battery in seconds - up to 40 times on a single charge. It's mistake-proof, making it safe for anyone to use and features spark-proof technology, as well as reverse polarity protection. 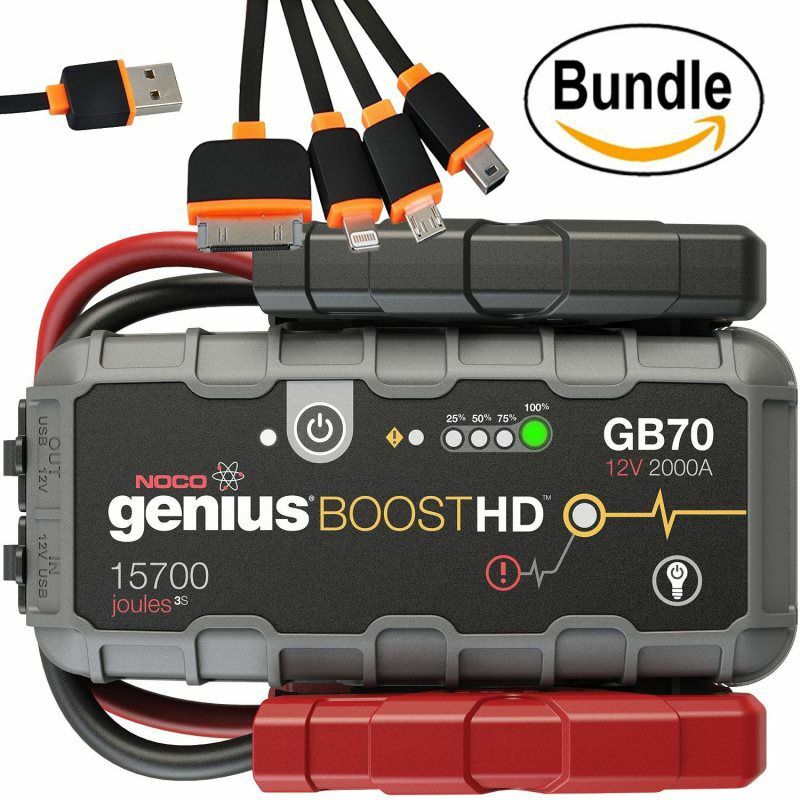 The GB70 lithium jump starter integrates with a high-output 400 lumen LED flashlight with 7 light modes, holds its charge for up to one year and features a USB battery pack for recharging personal devices on the go - up to 8 smartphone recharges. The GB70 features rapid charge technology that allows it to be recharged in just over three (3) hours, and a 12-volt auxiliary port for powering tire pumps, inverters, lights and more. It's rated at 2,000 Amps (15,700 Joules3S), and suitable for use on gasoline engines up to 8 Liters and diesel engines up to 6 Liters, such as a car, boat, truck, tractor and more. 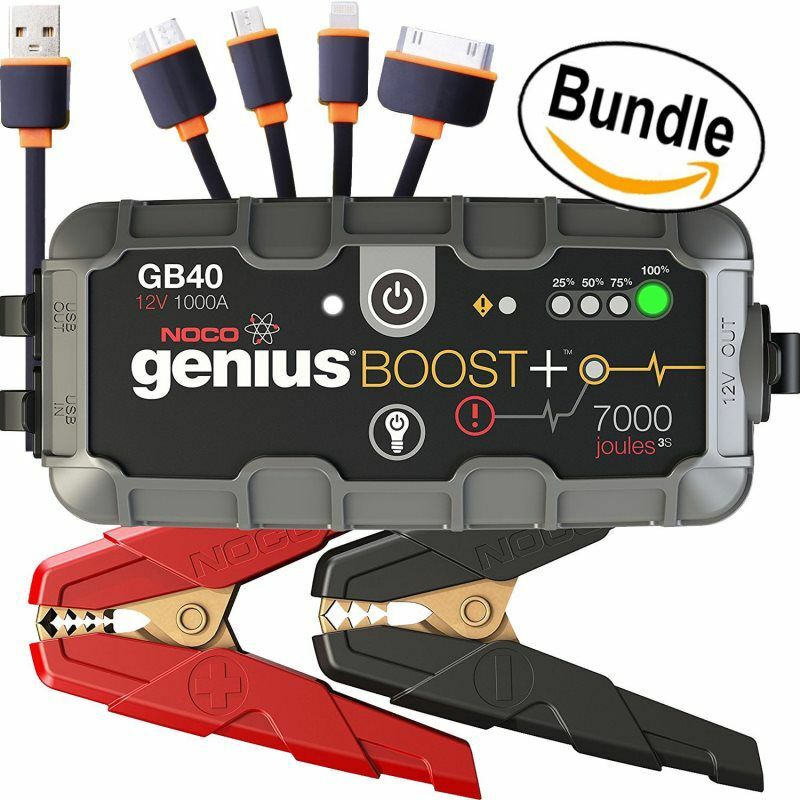 Includes the GB70, HD battery clamps, USB charging cable, XGC male plug, XGC female plug, XGC cable, microfiber storage bag, and our 1-year hassle-free limited warranty. 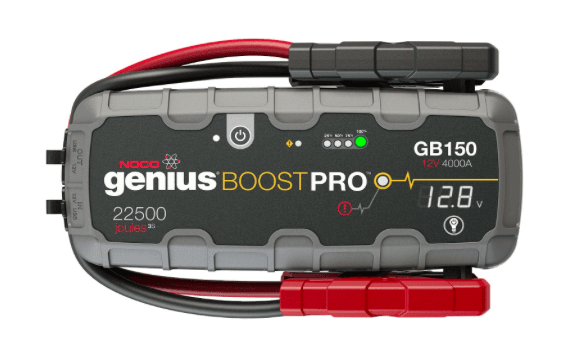 The GB150 is powerful, professional-grade, lithium-ion jump starter for 12-volt batteries. With it, you can safely jump start a dead battery in seconds - up to 80 times on a single charge. It's mistake-proof, making it safe for anyone to use and features spark-proof technology, as well as reverse polarity protection. The GB150 lithium jump starter integrates with a high-output 500 lumen LED flashlight with 7 light modes, holds its charge for up to one year and features a USB battery pack for recharging personal devices on the go - up to 12 smartphone recharges. 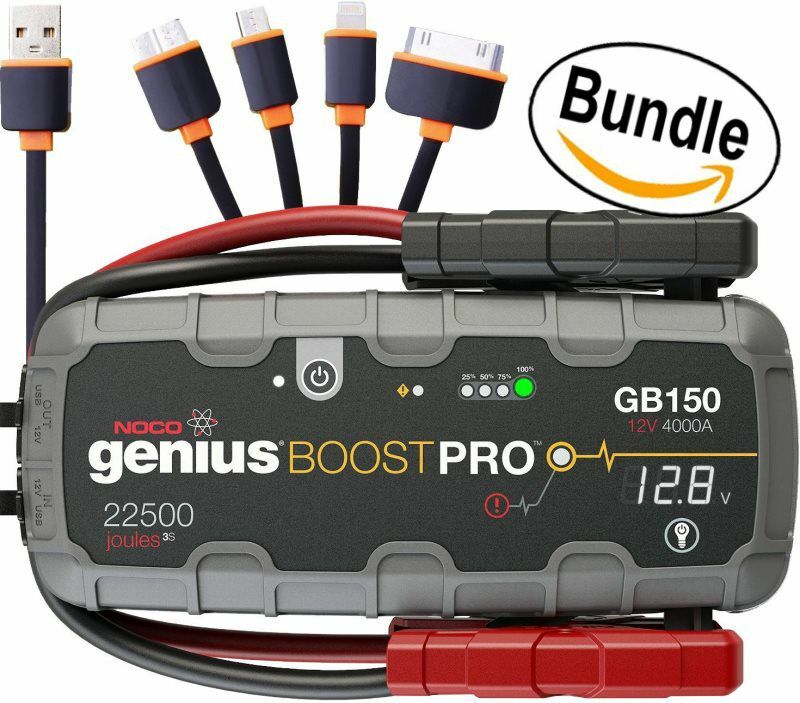 The GB150 features rapid charge technology that allows it to be recharged in just under five (5) hours, and a 12-volt auxiliary port for powering tire pumps, inverters, lights and more. It's rated at 4,000 Amps (22,500 Joules3S), and suitable for use on both gasoline and diesel engines up to 10+ Liters, such as a car, boat, truck, commercial vehicle, equipment and more. 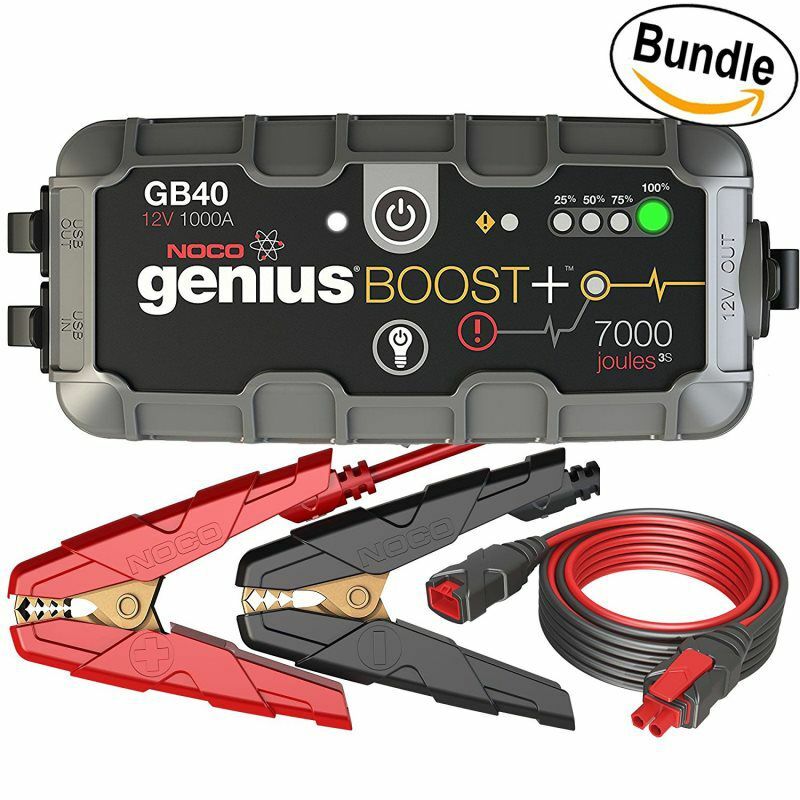 Includes the GB150, HD battery clamps, USB charging cable, XGC male plug, XGC female plug, XGC cable, microfiber storage bag, and our 1-year hassle-free limited warranty.